Houston’s The Palm, closed since February 16, re-opened on July 8, 2013. The popular Galleria-area eatery known for thick steaks and big lobsters, underwent a massive renovation and expansion, adding 100 more seats. Beyond updating the decor, it also added Wi-Fi, flat screen TVs and mood lighting; the menu has been tweaked, too. According to the 85-year-old company, the Houston redo is part of a nationwide updating. The Houston restaurant was chosen as the prototype because of the thriving restaurant economy here. The Palm, 6100 Westheimer Rd., Houston, TX 77057, 713-977-2544. Chef-owner John Sheely has been wowing eaters at his Mockingbird Bistro for more than 30 years and now he’s ready to open a new concept: Osteria Mazzantini, named for his mother’s Italian family, is set to open in the Galleria area in late summer or early fall of this year. Sheely says he'll serve rustic, handcrafted Italian dishes with top-quality ingredients, housemade fresh pastas and hand-tossed pizzas. English-born Paul Lewis, formerly of Cullen’s, will be the executive chef. Osteria Mazzantini, 2200 Post Oak Blvd., Suite 140, Houston, TX 77056, no phone. The Palm is offering Summer Lobster for Two through August 31. 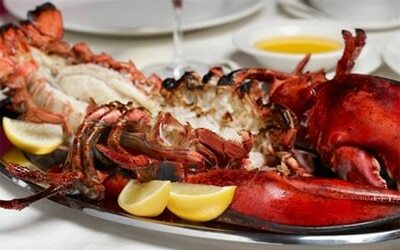 The special, priced at $79.95, includes a four-pound jumbo Nova Scotia lobster tail, two starters (Caesar salad, lobster bisque, watermelon and mozzarella salad) and two individual sides. 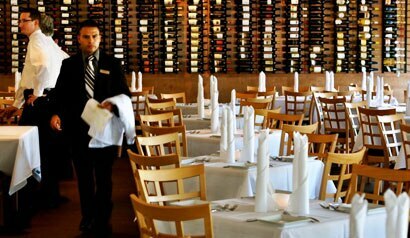 The Palm, 6100 Westheimer Rd., Houston, TX 77057, 713-977-2544. On July 6, National Fried Chicken Day, Max’s Wine Dive introduced a gluten-free fried chicken. Jerry Lasco, founder and CEO of Lasco Enterprises, which owns Max’s and The Tasting Rooms, said: “As someone who has celiac disease, I'm excited that we now have the capability for all of our guests to enjoy our award-winning fried chicken, a classic American dish.” The chicken is made with a blend of gluten-free flour and dried cauliflower fibers, which create a fried-like coating, and is served with mashed potatoes and collard greens. The chicken is fried in a separate fryer and prepared in an independent area, where exposure to gluten is less likely to occur. Chef Michael Pellegrino has also created other gluten-friendly items such as duck and corn pudding with carrots, broccoli pesto, asparagus and blackberry bordelaise; saffron crème brulee and lobster salad with frisée, baby kale, orange segments, pistachios and orange emulsion; and the Brown Bag Delight with heirloom tomatoes, red onions, tomatillos, fennel, lemon and rosemary, all steamed in a brown bag. Max's Wine Dive, 4720 Washington Ave., Ste. B, Houston, TX 77007, 713-880-8737. James Coney Island, Houston’s hometown hot dog chain with 21 locations, is teaming up with local chefs this summer for a Chefs and Show Dog promotion. In June, Randy Evans, the chef of Haven's, created a Huntin’ Dog that was sold at all of the locations. This month, it’s Kata Robata Sushi + Grill’s chef Hori’s turn. His creation, the Kata Rodoga, is a panko-crusted, deep-fried Hebrew National hot dog in a grilled Slow Dough bun with soft-scrambled eggs, Japanese curry sauce, pickled cucumbers and onions, Yuzu Kosho QP mayo and micro greens. This fusion Japanese dog will be on sale through July for $6.29. Sparrow Bar + Cookshop’s chef Monica Pope will be creating the next show dog for James Coney Island. Lunch specials at Americas include the popular tres leches cake and a cooling mojito, both of which are priced at just 88 cents in honor of the company’s 1988 founding. The specials are available at Amazon Grill, all Americas locations, Artista and all Churrascos locations. In addition, diners at Americas and Churrascos restaurants can order a three-course chef pairing menu for two priced at $88. The July specials are just the beginning of the 25th anniversary celebration for the company started by chef Michael Cordúa. There will be special events planned for the venues in the fall. Americas, River Oaks Shopping Center, 2040 W. Gray St., Ste. 200, Houston, TX 77019, 832-200-1492. Chef Soren Pederson has split from Sorrel Urban Bistro, the restaurant he helped open in 2011. Owner Ray Salti declined to comment other than to confirm the parting of ways. Pederson also will no longer be associated with Salti’s other restaurants or catering company. Sous chef Michael Nutt has been tapped to take over the kitchen at Sorrel, while Pederson is focusing on a cooking show he recently started that airs in Houston. Sorrel Urban Bistro, 2202 W. Alabama St., Houston, TX 77098, 713-677-0391. In another surprising move, Katsuya by Stark, the trendy sushi eatery in West Ave, has closed. Sources say sushi chef Katsuya Uechi no longer wanted to be involved in the Houston outpost of his Los Angeles-based eatery. Local investors will turn the site into another Asian-inspired restaurant helmed by local chef David Chang. Katsuya by Stark, West Ave, 2800 Kirby Dr., Houston, TX 77098, no phone.